Green Chile Enchilada Soup! 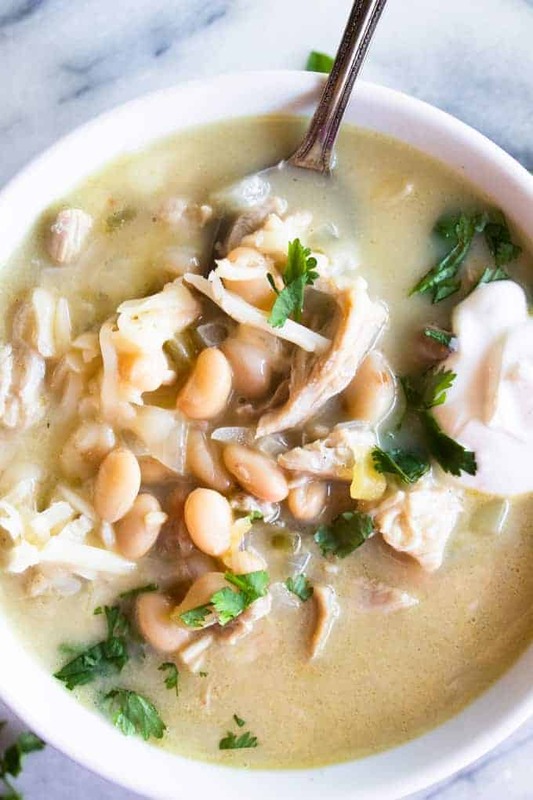 This creamy, comforting green Chile enchilada soup is loaded up with chunks of chicken, white beans, green chiles, and cheese. Taking only 30 minutes from start to finish this recipe is perfect for a quick weeknight dinner for the whole family! Heat olive oil in a large dutch oven, or large pot over medium heat. Add the diced onion and saute until the onion is soft and translucent. Add the minced garlic and cook an additional 30 seconds until fragrant. Add in the chicken broth, green enchilada sauce, shredded chicken, drained beans, diced green chiles, cumin and salt. Stir to combine. Bring the soup to a simmer, cover and simmer for at least 10 minutes. Remove the pot from the heat, allow to cool for about 2 minutes, then add in the shredded cheese. Stir while the cheese melts into the soup. Serve warm and top with any additional toppings desired. After a quick sear with salt and pepper, fill the pan with a small amount of water, just enough to come halfway up the chicken, and bring this to a simmer. Let the chicken cook, or poach, until they reach 165 degrees. Then remove and shred.